So January is coming to a close – and what a cold one it is! I hope you, your loved ones and your plumbing pipes are all safe and warm. A warm up is in our future, so hang in there. Here’s a little recap of the shenanigans over at the Misadventures project – we’re getting closer to the finish – if that’s possible. We’ll start with a small problem. When I drew up the kitchen island design, the cabinetmaker missed this little detail. I needed some extra room next to the dishwasher bay to add the receptacles and switches between the upper and lower countertops. I thought I could get away with these shallow switch boxes – but nope, not gonna work. Looking at the back of the dishwasher bay, you can see a boatload of electric that needs to find a home and these little metal boxes just aren’t quite big enough. Oh the pains of free-style design. I fabricated a 3/4″ panel to attach to the cabinet side to give me a little more depth for the electrical boxes. I changed out the metal boxes for these – the blue boxes have a little more room for wire wrangling. So with a little persuasion we have all the wires where they belong – and the dishwasher fits as well. Another little misstep. I thought the white controls and receptacles would work – but no. I’ve changed out these eyesores to black. The two receptacles are gfi protected on two circuits – just as code requires. The others are a speaker balance control and a 3-way switch for cabinet lights. I was trying to get everything done before the countertops went in – it makes life so much easier when you can work from the top. I’ve plumbed the main sink and dishwasher and run electric for disposal and dishwasher. Final work to get ready for the countertops I bought back in 2010 – Time to get rid of my cardboard counter you can see in the background. Steel plates were glued and bolted in place to the counter overhang. I added a 14″ overhang at this end for a small seating area. Of course, the countertop install day had to be one with a rainstorm that wanted to tag along. So after a couple of hours the quartzite counters are in place, ready for me to start on the finish plumbing. I bought these stone slabs so long ago I had forgotten what they looked like. You can read the post about the counters here. The kitchen is 27′ long and opens into the 16′ wide sunroom, which makes for a 43′ long sightline – it creates a very open and bright workspace. The upper sink area is a standard 36″ with the lower level at table height (30″). The modified galley kitchen design with central island allows traffic to flow through the kitchen to any other part of the house without passing through the working side of the kitchen. Which is a good thing when someone is in there with a hot stove and sharp knives. The lighting may seem a little overboard, but since I do lighting design as part of my day job it was designed to create a shadow-free work area. The centers are 3″ MR-16 LED and the others are 4″ led recessed lights. The aisle lights are a schoolhouse design. Since the trim on the lights are the same color as the ceiling, they minimize the Swiss cheese effect of all those ceiling light holes. The little wine bar area is almost finished with the exception of the tile backsplash and the glass shelves. And the plumbing of course. Looks like my wife is already finding a home for her flammable liquids. The small deep prep sink by the stove will have a instant hot water dispenser. The tile backsplash and single shelf also will need to go in. Since my wife is Filipina, she likes to have one or more girlfriends over to cook together. The kitchen accommodates three in the kitchen to prepare food. Instead of hanging pendant lights, I opted for these schoolhouse style lamps that would have been used in the 1930’s. The lights allow for a multi-directional light to complement the directional recessed lights. The upper level cleanup sink is a single bowl with the dishwasher to the left. The lower drawers on the island are for dinnerware and serving pieces. This position makes it easy to load and unload the dishwasher. 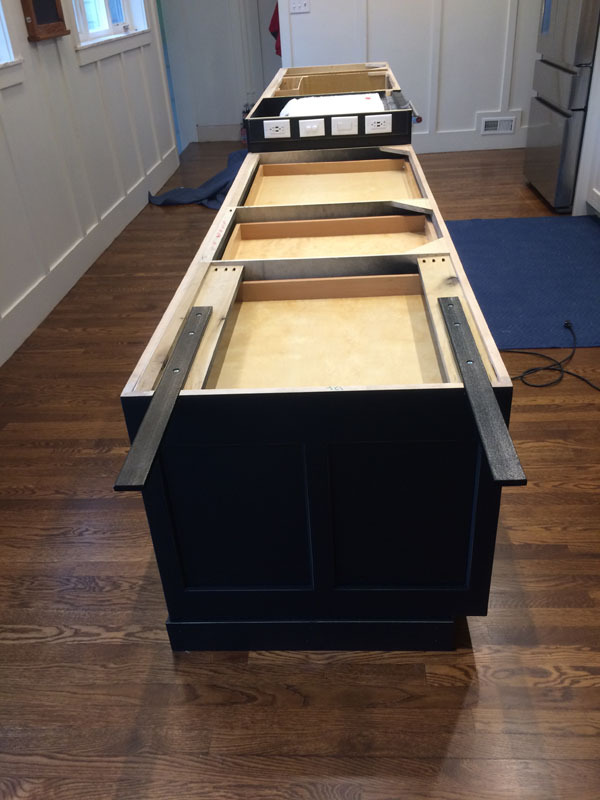 The island is 30″ wide, a little narrower than standard, but the 9′ length of the lower counter makes up for the width. My wife likes to work off the lower level, especially when rolling dough and preparing some of her more complicated recipes, as she has room to spread out. So onward we go, mare details and cabinets to build, but at least we’re getting to the pretty stuff. I promised some bling – it’s just taken nearly 10 years to get here. Stay warm and see you soon.